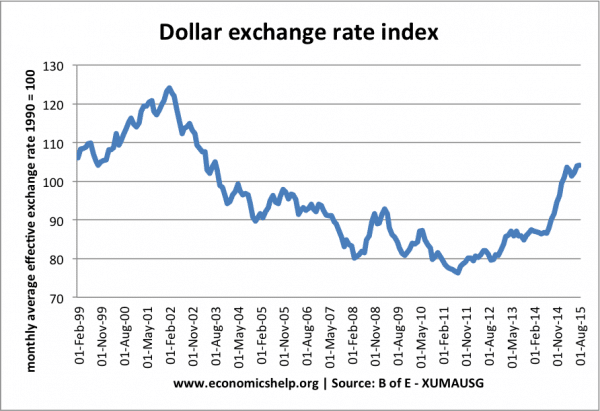 Readers Question: When exchange rate goes down, what positive thing can happen? A fall in the exchange rate is known as a depreciation in the exchange rate (or devaluation in a fixed exchange rate system). It means the currency is worth less compared to other countries. e.g. a depreciation of the dollar makes US exports more competitive but raises the cost of importing goods into the US. Therefore there will be an increase in exports and decrease in the quantity of imports. Domestic firms will benefit from increased sales. This may lead to job creation and lower unemployment, especially in export industries. A depreciation increases the cost of imports so there will be an increase in cost-push inflation. A depreciation makes exports more competitive – without any effort – in the long-term, this may reduce incentives for firms to cut costs, and could lead to declining productivity and rising prices. 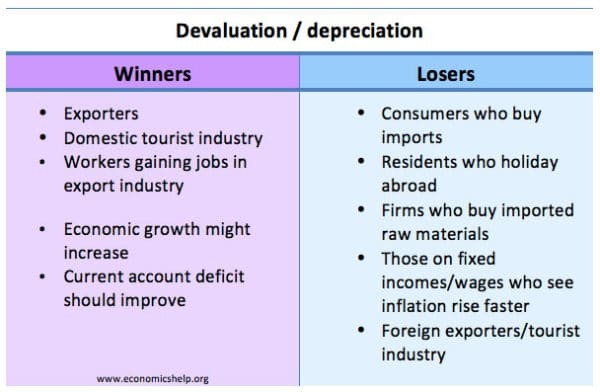 The effect of a depreciation in the exchange rate depends on the state of the economy. 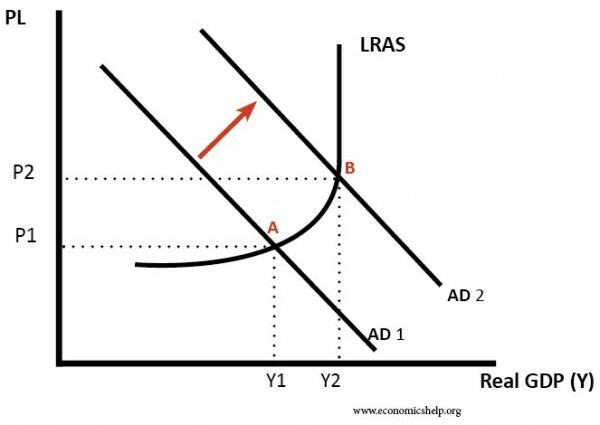 If the economy is growing quickly and close to full capacity, then a fall in the exchange rate is likely to increase inflationary pressures. In a recession, the fall in the exchange rate may only cause some temporary cost-push inflation. A depreciation will tend to improve the current account balance of payments. This is because exports increase relative to imports. However, this assumes that demand for exports and imports are relatively elastic. Tends to increase the rate of economic growth and reduce unemployment. Tends to benefit exporters, but makes imports more expensive. Benefits the domestic tourist industry. It is more expensive to travel abroad and foreigners will find the UK more attractive. Consumers likely to see higher prices – at least for imported goods. State of the economy. If the economy is in a recession, a depreciation may help boost growth with little effect on inflation. But, if inflation is already high, a fall in the exchange rate will make inflation worse. Other components of AD. If the exchange rate falls, this increases export demand. However, if there is a fall in consumer confidence, there may be no overall increase in AD. Time lag and elasticity of demand. In the short term, demand for exports tends to be inelastic (therefore only a small increase in demand). Over time, demand becomes more elastic. Therefore there is a bigger increase in demand for exports. Depends on the cause of the fall in the exchange rate. For example, countries experiencing a balance of payments crisis (e.g. 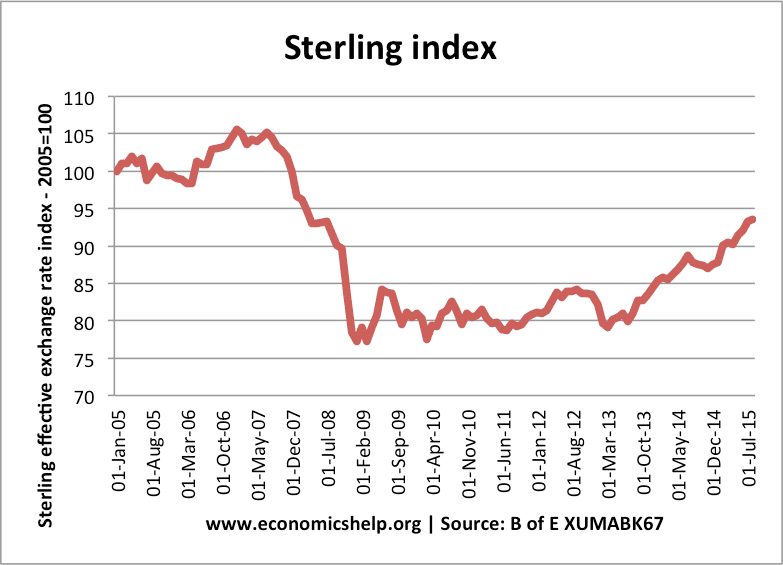 Russia 2007/17) will see an outflow of capital as investors become nervous over the speed of the currency devaluation. 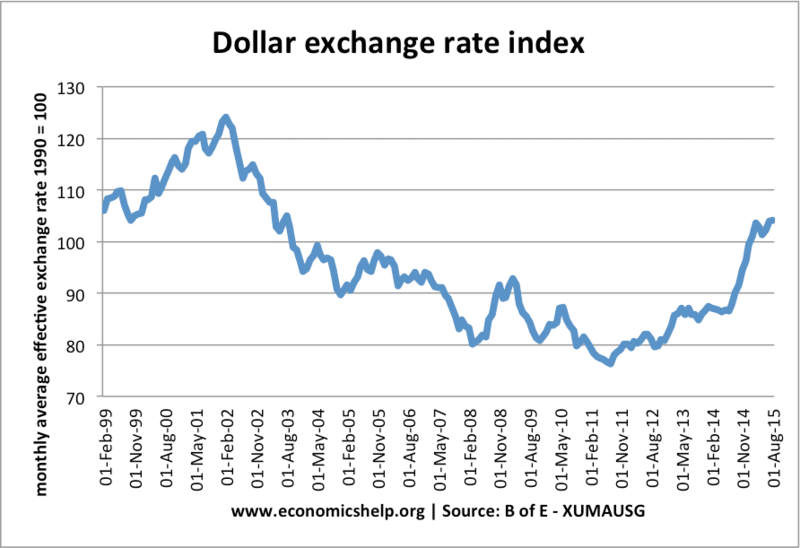 The steady fall in the Dollar 2001-08 was generally a period of positive economic growth. Inflation remained low during this period because – apart from import prices rising – inflationary pressures were generally low. 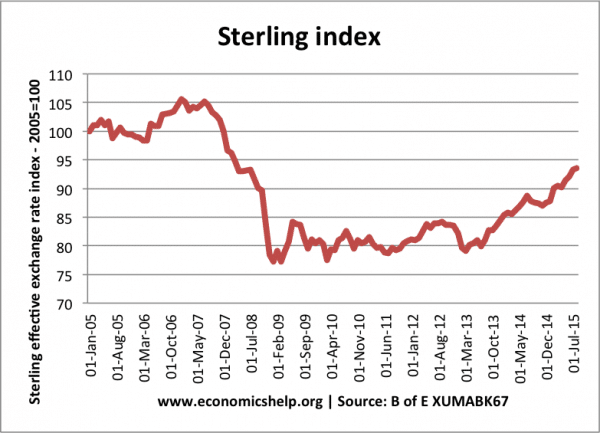 Sterling fell by approx 30% between 2007 and 2009 – this was due to the UK economy being hit hard by global credit crunch and damage to the financial sector. Often a fall in exchange rate boosts domestic demand. But, the UK economy still went into recession because of the credit crunch, fall in bank lending and global recession. 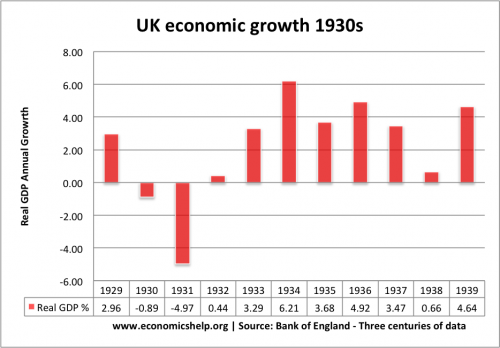 In 1931, the UK economy was in a serious recession – with unemployment rising towards 20%. 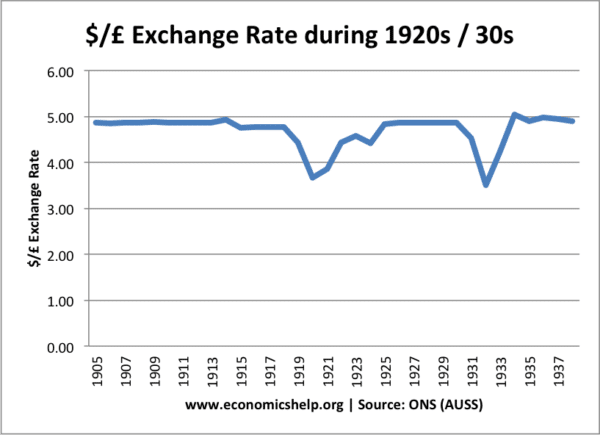 In 1931, the UK left the Gold Standard, causing the Pound to fall in value. 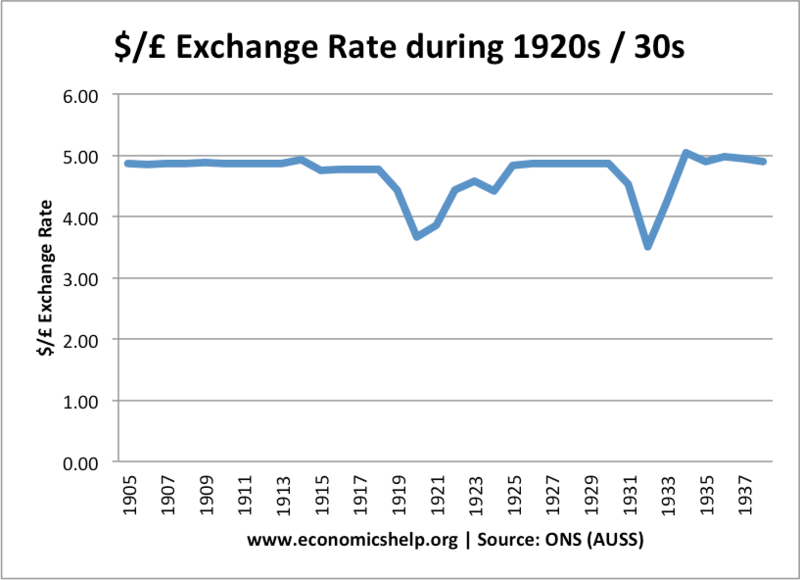 This fall in the exchange rate enabled the economy to recover quicker than many other countries stuck in the great depression. ← How do share prices affect firms? That is really interesting that the values of different types of money are falling. It would be nice if our exchange rate was better so we could get good value. That is something that I would love to have if I travelled the world.